Spectators and competitors enjoyed a thrilling day of cross-country at The Dutta Corp. Fair Hill International Three-Day Event where international pairs battled Derek di Grazia’s challenging track. 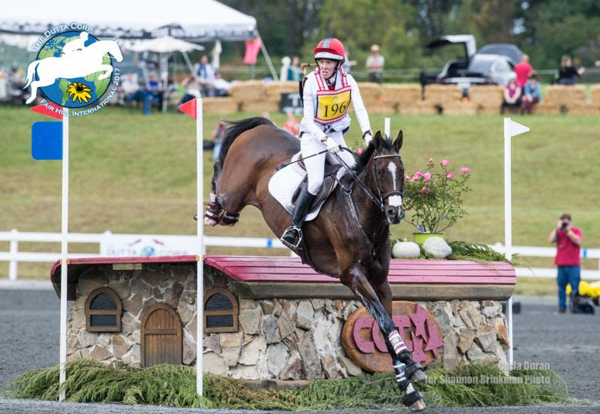 Colleen Rutledge took over The Dutta Corp./USEF CCI*** Eventing National Championship with Covert Rights, and Tamra Smith and Sunsprite Syrius kept their lead of The Dutta Corp./ USEF CCI** Eventing National Championship. A fast cross country round awarded Maryland-native Colleen Rutledge and her own Covert Rights the top position in the CCI*** division. The 11-year-old Thoroughbred Cross remains on his dressage score (39.8) after a fault free performance. Overnight leaders Selena O’Hanlon and Foxwood High finished four seconds above optimum time to drop them into second place. John and Judy Rumble’s 14-year-old Canadian Sport Horse picked up 1.6 time penalties to sit on a two-phase result of 41. William Coleman and The Conair Syndicate’s Tight Lines leapt from 13th to third after an incredible effort across country. The 10-year-old Thoroughbred continues on a score of 46.3. Tamra Smith and Sunsprite Warmbloods’ Sunsprite Syrius were the first combination to come home clear within the time on Saturday’s cross country. The 9-year-old Trakehner gelding made quick work of Derek di Grazia’s course to remain on his dressage score (40.9) going into Sunday’s show jumping finale. “I didn’t know what to expect. He hasn’t been in an environment like this before. He was super. He didn’t question one thing. He was spot on. You bring them here to the two-star at Fair Hill and know if you definitely have a three-star horse and beyond, and I definitely feel that,” she said of the young horse’s promise. Following Smith’s lead, Cornelia Dorr also remained in second place with her own Louis M, a 12-year-old Rheinlander gelding. Dorr piloted both Louis M and her own fifth-placed Sir Patico MH to double clear cross country results. “My first one, ‘Hugo,’ was amazing. He and I have an wonderful relationship. I felt super confident with him. It was nice to go out and do all that with him then be able to make tighter lines on Louis. They were both great and super fit. I’m happy with them,” she smiled. Again in the CCI**, William Coleman climbed the leaderboard, this time with Off The Record, an 8-year-old Irish Sport Horse owned by the Off The Record Syndicate. The duo completed the course penalty-free to move into third place on a score of 49.8. Show jumping concludes the competition on Sunday, October 15.